With the largest open-top Hop-On Hop-off City Sightseeing bus service in the world! 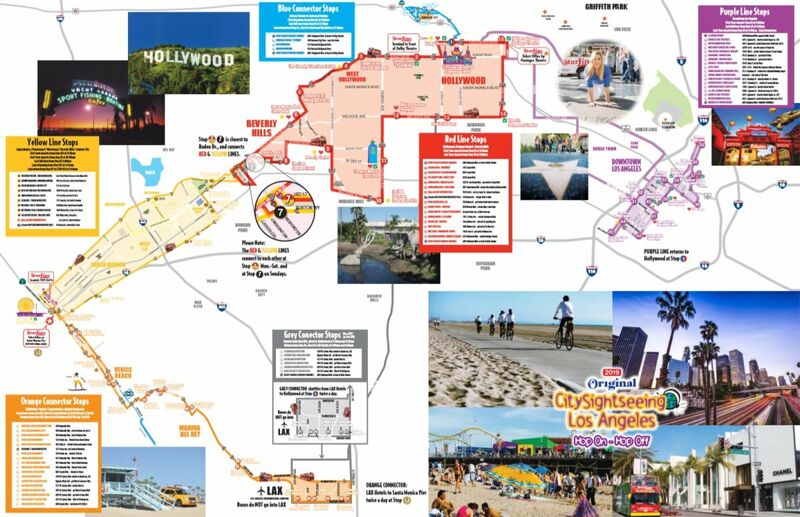 Discover the many marvels of Los Angeles attractions on the ultimate customized tour in comfort and style! Departs 9:00am, every 30 minutes until 5:00 pm, for the last full 2 hr loop. Departs 11:00 am, every 60 minutes, until 5:00 pm, for the last full 2 hr loop. Departures from stop # 92 8:00 am and 8:30 am and returning from stop #57 5:15 pm and 5: 45 pm. Jimmy Kimmel Surprises Hollywood Tourists at the Oscars on one of our bus tours! At Starline Tours, our Hop-On Hop-Off double decker buses are your passes to the city, delivering incredible adventure and great value for your money. We offer three main types of Hop-On Hop-Off bus passes, including 24 hour, 48 hour and 72 hour tickets. It's an ideal way for first time visitors to get to know Los Angeles, and returning vacationers can take advantage of our convenient services to explore the city more deeply, and at their leisure and convenience. Our system is simple – just purchase your ticket, then board our bus at any of the 70 stops we maintain throughout the greater Los Angeles area. We provide a detailed schedule with every ticket purchase, making it easy to plan your day. During the ride, you can enjoy pre-recorded tour guide narration in your choice of nine languages, including English, Spanish, Portuguese, Chinese, Japanese, Korean, German, French and Italian. When the bus reaches a spot you'd like to explore in more detail, simply disembark, take all the time you want to see the local sights, then head to the nearest Starline Tours bus stop to hop back on and continue your tour! Our four primary Hop-On Hop-Off routes cover everything from downtown Los Angeles to the city's stunning Pacific coast. Board the Red Route to experience the glitz and glamor of Hollywood and Beverly Hills, including such world-famous sights as Rodeo Drive, Sunset Strip, Melrose Avenue shopping district, the Hollywood Walk of Fame, the Dolby Theater and much more. Take the Yellow Route to travel between Beverly Hills and Santa Monica, enjoying stops along the way including Fox Studios, the 3rd Street Promenade and Santa Monica Pier. Use the Blue Connector to link between Universal Studios and TCL Chinese Theatre, or the Orange Connector to travel from LAX-area hotels to Marina Del Rey. To learn more about our L.A. Hop-On Hop-Off bus services, or to book your trip, please give us a call at 1-800-959-3131 or (+1) 323-463-3333.